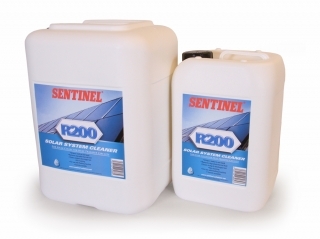 Sentinel R200 Solar System Cleaner removes blockages, sludge and deposits to restore efficient operation and is available at PlumbNation Heating Supplies. It's proven that with time prolonged exposure to elevated temperatures can cause most thermal fluids to degrade. Apart from the reduction of effective lifespan for the fluid, degrading fluid can adversely affect the performance of the system as a whole. The thickening of thermal fluid that accompanies the ageing process can cause deposits that narrow the diameter of pipes, eventually leading to blockages. The freezing point increases, the pH decreases and heat transfer capability gradually reduces. In solar thermal systems where temperatures of over 200°C occur regularly, glycols will break down due to the chemical action of either heat or light and this degradation occurs quickly. 20 minutes of cleaning with Sentinel R200, particularly when applied with the Sentinel SolarFlush unit, will disperse and remove deposits, preparing the system for a new dose of heat transfer fluid, such as Sentinel R100 Thermal Fluid. Like Sentinel R100, Sentinel R200 is supplied ready to use and is easy to dispose of. Ready to use without dilution. Only requires 20 minutes use. Effective at low and room temperatures. Non-foaming and easy to dispose of.